How do I make the Reports run on only UK stocks and UK Groups and Sectors? Open the Reports from the Charts Tool Bar. From the Reports menu, select Global Properties. 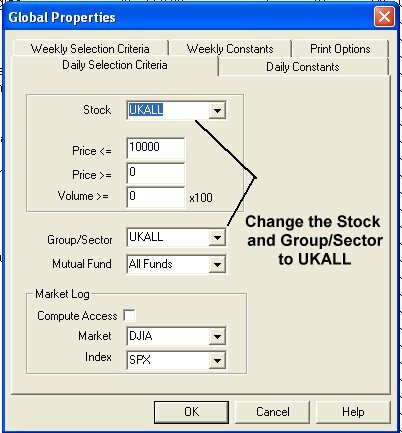 Change the Stock and Group/Sector areas to UKALL in the Daily Selection Criteria tab. Repeat for the Weekly Selection Criteria tab if desired. Click OK. When you next download data and/or generate reports, the reports will reflect the changes. When I click on the Reports button I get a GPF, or an error about VBAJet, how do I correct this? Go to www.aiqsystems.com/Dao.exe and run the install for DAO. Access Plot – Calculation and Interpretation. The way the Access plot is calculated is as follows: The database is defined by using the Master Ticker List (All the stocks in the data base) or any list structure including group sector list structures. This is set in the global parameter of reports. For each stock, all indicators as listed, are calculated and then summarized as the percentage of stocks with increasing values for these indicators. The arrows are a graphical representation of that summary. Market Log – Explanation and Interpretation. It is not unusual at all to have the Market Log Access plot disagree with the market section, or the group rotation. In fact, that’s more common than not. The Market log is set up to give a complete look into all areas that WinWay has found that give market insight. The Access log looks at all the stocks in your system and determines for each indicator, positive or negative. The arrows correspond to the percentage of all the stock that are positive or negative. Since breadth usually leads the market, this is considered a early warning or anticipatory indication of what might come. The market plot section simply looks at the current conditions of the DJIA market indicators. This generally is slightly early to slightly lagging current market conditions. The Sector rotation is built on Trend Score, which by nature tries to determine strength of trend and therefore is more of a lagging, or confirming indication. 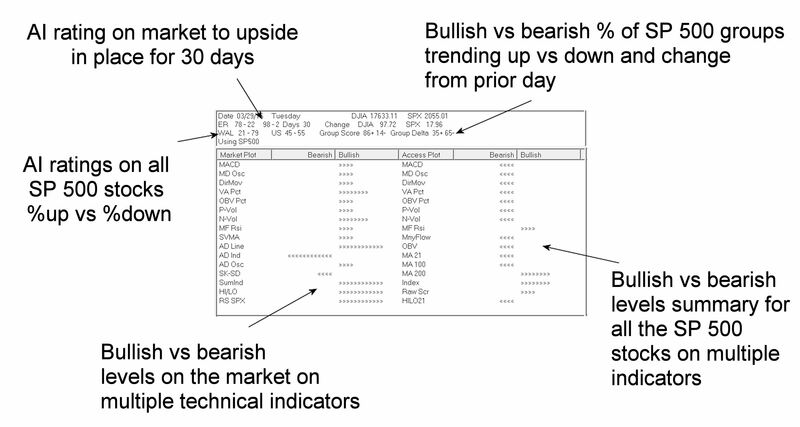 The proper way of using the Market log is a combination view of: 1. Getting an early indication that the current market direction may change with a shift in the Access plot. 2. Then within a few days the market plot shows a change. 3. Full confirmation with Sector rotation. Also in the Market log are the U.S. , WAL and GS, and DTS. US and WAL tend to be a 1,2 early warning, (Values of 75 or greater) and day to day changes in TS and DTS also provide a good indication to internal changes. The Access Plot is not appearing on the market log, what do I need to do? Click on report, global properties and place a check on Compute Access.